Social media has changed the landscape of the internet pretty heavily. Whereas before, having a website was considered a privilege and quite a big deal, now we have the ability to create a Facebook page or an Instagram account that serves as a marketing or informational hub for a product, business or blog. As these changes occurred and a lot of people went onto the bandwagon, web hosting and everything along with it, including domain names got mystified. There are talks about expenses, memories of the dot-com bubble and various other whispers that grow some pretty big misconceptions. It’s about time we take the chance to bring them down. A domain is a much simpler thing than you think that works in a beautifully sophisticated way. You can get your very own domain here. Hostinger’s domain search tool is one of our favorites. Get suggestions, it’s a trusted registrar and doesn’t break the bank. So the excellent place to start is talking about the idea that domains are just for websites. Right out of the gate, let's address the fact that it isn’t true. No one is going to force you to make a site. There are multiple reasons to own a domain that aren’t a website. For starters, if you’re looking towards becoming an influencer, or put your voice out there as a public person, it might be smart to secure domains with your last name, to protect yourself from any disinformation. Treat your name as a brand. You can’t go wrong with that. If you can think of an idea that would make a brand vulnerable, chances are the same might apply to your name too. That’s not all. You can have a domain based email, send out emails from a professional looking address. When you see a businessman use Gmail, it doesn’t exactly scream trust. As we move on, it might be a good time to touch on the idea of the dot-com burst of 2002. It’s not like some people think, that people literally over invested in a domain. What happened was that too many eggs were put in a single basket. Multiple businesses and retailers invested massive amounts of money without redundancy plan. When these online businesses went under, there were financial repercussions that to an extent are still felt today. By the way, you don’t actually own a domain name, technically. Once you register it or reserve it, you do indeed choose to do whatever you want with the domain (within the legal means), but at the end of the day, the domain works as something similar to a subscription model. You can register and reserve the domain for anything from 1 to 10 years. But once time runs out, and if you forget to renew your reservation, you might lose it. It won't be taken away from you, but someone else might reserve it before you. Sounds like a massive commitment, doesn’t it? Ten years, must be tons of money? Well, it isn’t. Really. A common misconception is that domain registration is super expensive. It really isn’t, especially if you’re going about the registered smart. Sure, if you’re going for .com domains with one-word labels, they’re going to be reserved or will cost an arm and a leg. But if you’re smart, you can try and shoot for a .xyz or many other kinds of domains with alternate TLDs. Don’t get caught up on .com! So, you decided that having your own domain is indeed a good idea. What now? Time to google and figure out how that goes? Luckily, that’s not the case. You can use a tool like the one above, provided by Hostinger and become a proud owner of your very own domain within minutes. 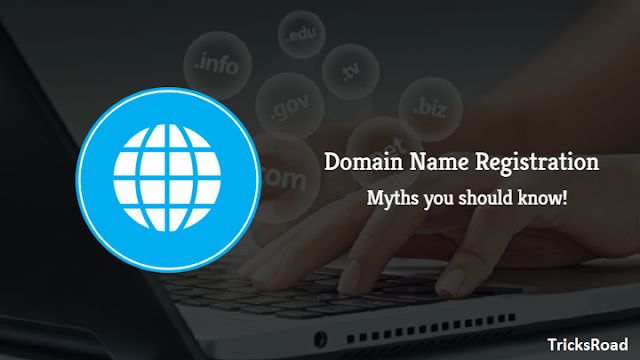 There are no restrictions on who can register a domain name! That tool will help you find alternatives if the one you want is taken and will go through the process along with you! All you need is to provide some really basic personal information and have a working payment method. It’ll take a minute. Literally. That’s about as much as you need to know. With the most common wrong ideas cleared away, you should have the know-how of going at it and picking out a domain. For extra help, there are tons of tools that can help you come up with brand ideas, teach you about SEO and other notes that are worthwhile to take into account. A domain name is more than just a link. It’s a representation of your business. It’s the first impression. Make the right one.